So, I hope everyone in the US is enjoying their 4th of July weekend. We had the opportunity to see the National Fireworks Display from near the Washington Monument, and enjoyed it immensely. Other than that, I have spent my time working on my 1st design. I realized that I needed to go into the model and do some clean-up and moving of items to specific layers within the model to make it easier to use when making the construction model. The result of this, is the ability to generate some interesting images (that would never be visible when built), such as this one of the framing, with the plumbing and electrical visible through the framing and windows. 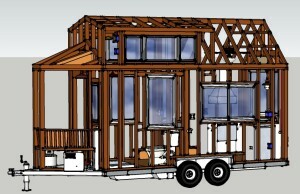 Since the electrical fixtures and the actual plumbing fixtures are not installed until nearer the end of construction, you would never see the tiny house in exactly this way. Tomorrow, will be more of the same, as I move closer to having the design finished. I have about a month left before we head back home to Alabama, and unless stuff happens to delay things (which has happened before) I hope to have both the design finished and the website up and operational. Crossing my fingers!